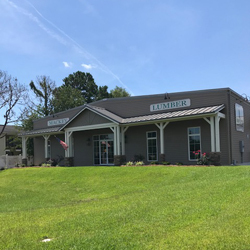 At Mackey Lumber and Adel Trading Company, we offer a full line of building materials including lumber, hardwood and molding, nails and fasteners, roofing, sheetrock, plywood, paneling and concrete wire and rebar. We have experienced salesmen to provide accurate quotes and the materials best suited for your project. The Mackey Lumber and Adel Trading Company yards stock a full range of wood products for all of your consumer and industrial needs. We have a many different species of wood and various sized pieces to fit your needs. Stop in today! We carry a wide selection of hardware and tools that will help you complete any project! Our stocked selection includes interior and exterior furniture hardware and tools. Our staff will work with you to help you find exactly what you will need so that you can work quickly and efficiently. Our Mackey Lumber and Adel Trading Company experts will work closely with you to get your house or room the color you want. We offer many different paints as well as any tools you will need to make painting possible; from brushes to paint thinner. Our Kitchen & Bath Department is built to meet your needs. We have an experienced staff who will work with you, through every step of the process, to create the kitchen & bath that you have always dreamed of. We are proud to offer many different wood species and nearly every paint and stain in the spectrum. We offer an array of seasonal products to suit your needs anytime of the year. Our experienced staff will work with you to find the perfect piece to both compliment your home and your budget.